Posted on December 1, 2011 March 4, 2015 by Sarah R.
The website/online lab R-Shief has announced a three-day data visualization hackathon designed to create opportunities for new ways of viewing and understanding #occupy movements worldwide. 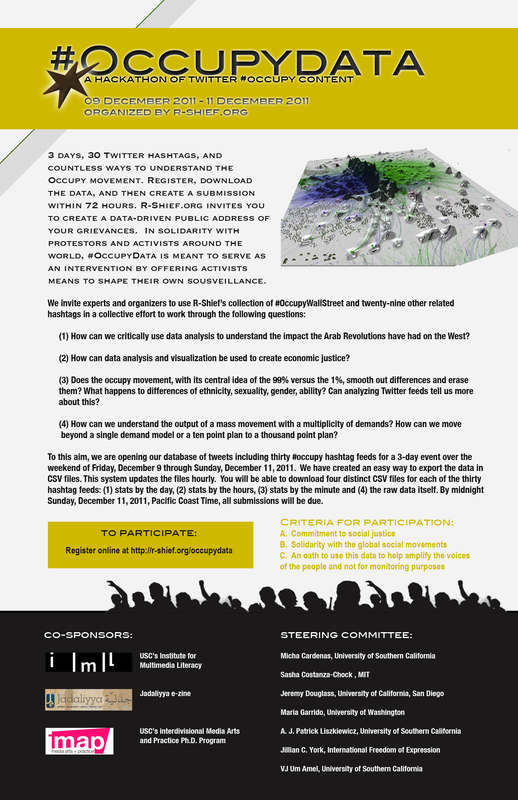 R-Shief is offering its data sets of #occupy-related Tweets to anyone wishing to participate in using it between December 9-11 in order to create and share data visualizations based on the data sets. Participants must agree to a commitment to social justice and promise not to use the data sets to nefariously monitor activists in order to gain access to the Tweets. Read more in the press release below and at R-Shief’s website. LOS ANGELES, October 26, 2011- 3 Days, 30 Twitter hashtags, and countless ways to understand the occupy movement. From 09 December 2011 to 11 December 2011, R-Shief, a lab that collects and analyzes Middle East content from the Internet, will hold its first hackathon with satellite locations throughout the world. The aim of this event is to give activists data collected from Twitter, as well as R-Shief’s machine learning analytics, in a collective effort to offer a public and shared repository for data and visualizations about the Occupy Movements. In solidarity with protestors around the world, #OccupyData is meant to serve as an intervention by offering experts and activists means to work together and think critically about the movement, its messages, and goals. Register and receive open access to export four CSV files for each hashtag — (1) stats by day, (2) stats by hour (3) stats by minute and the (4) raw data itself. (These files are automatically updated hourly). We encourage all participants to post links or images of the work that comes out of this to R-Shief’s blog رشيف | Blog or Visualize It section رشيف | Data Visualizations. Reports from this event will also be featured in Jadaliyya.